It is a good idea to carry back-up lighting in case your battery is exhausted, bulbs burn out, wiring gets screwed up, etc.. However I've got to admit that I've never had my primary system fail since I am religious about keeping the batteries charged. I've never had a lamp burn out since I began using sealed beam quartz-halogen lamps (I do not over-voltage). It is important to remember that these are strictly emergency back-ups. These flashlight headlights will not light up the road like a high power rechargeable headlight, and the rear strobe, while of sufficient intensity, flashes only about once per second, which is less than the optimal 120 fpm. Be extra careful when limping home with low power lighting; go slower and don't assume that vehicles will notice you. Here are a couple of suggestions for emergency back-up lighting. Experienced bicycle commuters carry a small flashlight for repairs; the proper flashlight can also serve as back-up lighting with the use of an inexpensive mounting system. The $22 Streamlight 51013 TT-3AA Twin-Task Flashlight (3 AA batteries) and a TwoFish Lockblock. This flashlight combines a Xenon bulb with three Luxeon LEDs, and you can switch between the two light sources. 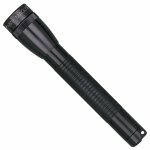 A less expensive option is the $10-11 2-AA cell Maglite, which lacks the Luxeon LEDs and is not quite as bright because the Xenon bulb operates at a lower voltage. Both of these flashlights offer an adjustable spot/flood beam for the Xenon bulb, which is very useful in cycling applications. 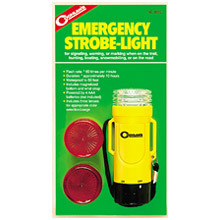 The $14 Coghlan 0220 Emergency Strobe Light is the best back-up to your 12 volt xenon strobe (assuming that you're using the Velleman strobe). However you will have to figure a way to attach it to your bicycle or your person. I suggest a Velcro strap through the wide eyelets. The Coghlan strobe flashes at a slower rate than the Velleman strobe and hence is not suitable for your regular rear strobe.